in truckload quantities (16 pallets) to the Austin/San Antonio areas. 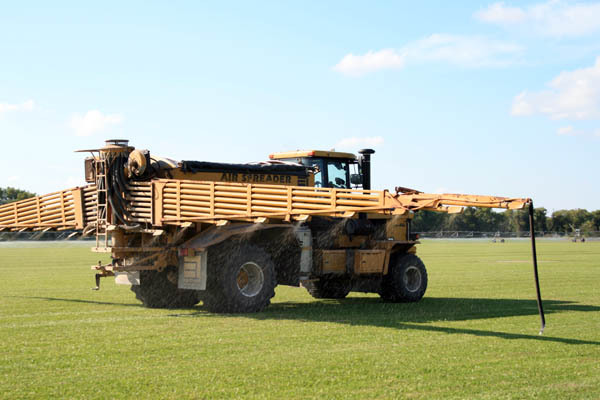 Our turf grasses are specially developed to thrive in the demanding climates of San Antonio and Austin or anywhere in Central and Southern Texas. Please give us a call at 1-800-753-5182 or 1-979-244-2496 for more information or a quote. 1. Remove all debris from area to be planted. This includes sticks, bricks, old lumber, and anything else that might impede root growth. 2. Spray all existing weeds and grasses with Round-Up. Allow approximately one week to 10 days for the weeds to die. Remove all of this material from your site. 3. The next step is very critical to proper turfgrass establishment. The existing soil must be tilled to a depth of at least 6". This will break up any hardpan that may have developed. Without this step, your turfgrass sod will be unable to develop properly by growing the needed root system.&nbps; This in turn will cause severe stress during the dry periods that are part of life in the San Antonio and Austin areas as well as very cold periods that can hit Texas. 4. If the soil you currently have is a compacted clay you will need to apply approximately 3 to 4 inches of good topsoil after you have tilled the existing soil. 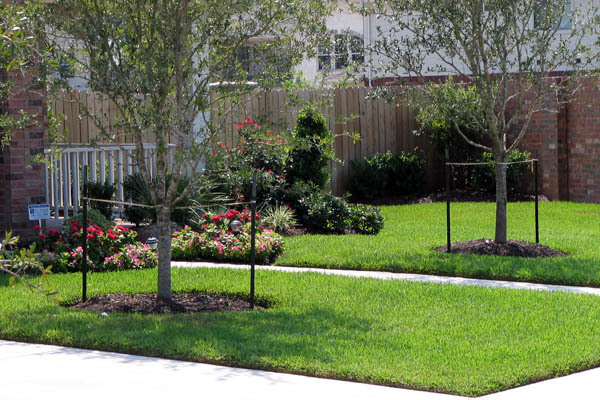 This will create an excellent medium to which your sod can attach and enhance early establishment. During periods of excessive rainfall this alluvial topsoil will help move the excessive moisture away from the plants growth points, reducing the chances of disease development and any other problems related to excessive moisture. 5. Prior to planting, the area must be leveled and any necessary drainage should be established at this time. Once the sod is down it will become very difficult to fill any low-lying areas without doing excessive damage to the turf. Remember, this is normally a once-in-a-lifetime endeavor and the more time you spend on the little things now the fewer problems you will have in the long run. 6. Do not apply any pre-plant fertilizer or pre-emergent herbicide prior to planting. These two inputs can cause severe damage to the root system you are trying to establish. If you are planting a quality turf from a reputable dealer, the turf should already contain an adequate amount of each of these to begin establishment. 7. Just prior to planting your sod you will want to cut away approximately 2 inches of dirt from any sidewalks, driveways, or curbs. This allows the turf to lay flush with the concrete and gives your job a much neater look. The excess dirt should be scattered across the yard so that you do not have any bumps under the sod. 8. You are now ready to start planting. Remember when you are making your sod selection, no matter what variety, there are basically two types of turf: quality sod and cheap sod. The two are never synonymous. Often times if you buy the cheapest sod you will also be buying problems that will consume your savings by the time they are corrected. 9. 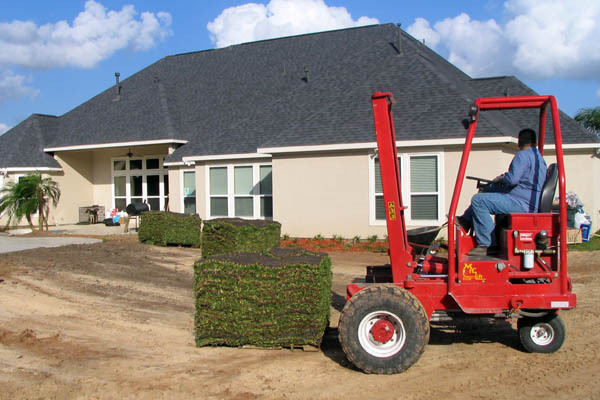 Once you have made your sod selection be sure you are ready to start planting as soon as the turf is delivered. The longer you wait the slower the rate of establishment for the turf. If the turf is not planted promptly you run the risk of your turf dying before it is ever planted. Begin installing sod along a driveway or sidewalk, pushing edges together tightly without stretching. Use a sharp knife, spade, or machete to trim edges of sod to fit the landscape. Be sure to stagger joints of the sod in a brick-like (running bond) pattern to avoid continuous seams. Always place sod across steep slopes and stake in place if needed. In hot weather, place unused sod in the shade and keep it moist until it is laid in the landscape. 10. Once the turf has been planted it should be watered immediately. 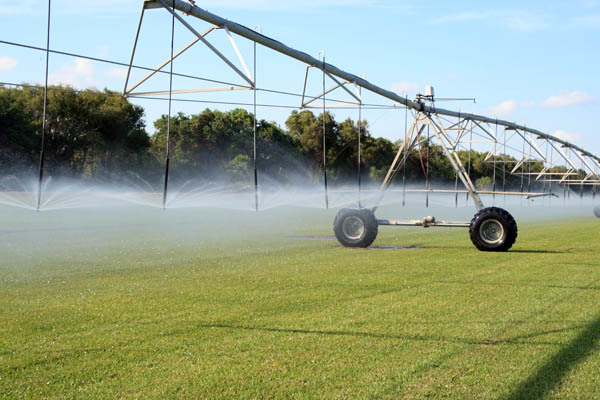 Be sure you have adequate irrigation equipment to water your sod to a point of complete saturation, that is, where water begins to run off within a few hours. This watering to saturation should be done only once. The purpose of the initial (first day) watering is to 1) give the grass a “jumpstart” after it has been transplanted, and 2) to “seal” the grass to the ground and make sure that there are no air pockets between the bottom of the new blocks of grass and the ground. The turf should then receive a light watering every 1 to 3 days as required (see TIPSHEET for detailed watering recommendations). This procedure should continue until the sod firmly attaches itself with the new root system. Once this occurs, watering should be curtailed to only during periods of wilting. This will require the root system to go down deeper in search of moisture and begin the establishment phase of a healthy turf. It is not uncommon for turf to go off color during the early stages after planting. 11. Fertilization and mowing should begin by the end of the third week. Fertilization should be done with a balanced fertilizer whose nitrogen source is in a slow release form. Fertilization should be done no more than three times during a growing season and very little nitrogen fertilizer should be used during very hot, dry periods as this will “burn” the grass. Until a new lawn has a fully-established root system, avoid heavy use. When mowing, make sure that you have a newly-sharpened blade and mow at the correct height for the grass (see TIPSHEET for more details on fertilization and mowing). These steps are a recommended full scale planting program. Any deletion to these may cause slower turf establishment and decrease the quality of your turf.